Tampa Bay flats’ fishing is some of the finest Florida fishing available. As the largest estuary in the state with four rivers exiting into the bay system, Tampa Bay is a perfect balance of clean fertile water to grow fish. 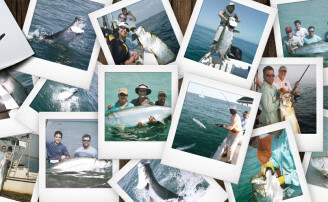 Tampa Bay flats’ fishing charters have a large area to chase fish, over 400 square miles. The most popular inshore fishing is for Snook, Redfish, Trout, Tarpon, Mackerel, Cobia, Pompano, Snapper, Grouper, and Shark. 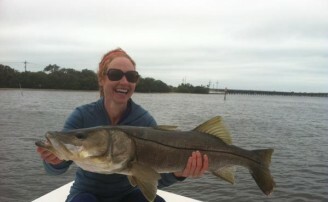 Snook are a year round target in Tampa Bay except for the coldest months. 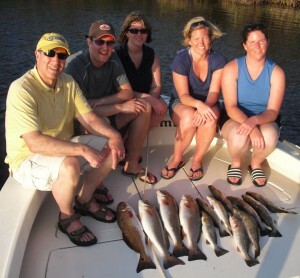 Tampa Bay fishing guides utilize the Redfish year round. They offer lots of action no matter what time of the year it is. Trout are the meat fish for most of the charter captains fishing the Bay. They are easy to catch, taste good and have more liberal limits. Cobias are found in the shallow flats in the spring and the fall. In the late fall and early winter some of the shallow flats close to the power plants also have good Cobia fishing. In the summer there are a few around Bay area structures as well. Mackerel are good throughout the year in different Bay area locations except during the coldest water temperatures. Pompano fishing can be good throughout the season depending on location and water temperature varying year to year. Grouper is generally best in the fall, winter and spring in the Bay. The majority of them are found further offshore in the summer when the water warms up. Snapper is best in the Bay during late spring, summer and early fall. Shark fishing is good year round in the Bay except during the coldest months. The warmer months are the very best for Sharks. Tarpon fishing is good in throughout the Bay in varying locations depending on the month. March and April are a good time for Tarpon on Bay area structures. May through July marks the peak migration for Tarpon when large schools flood the mouth of the Bay. August through November is much like the early spring months for them. Tampa fishing guides enjoy the upper Bay around the city utilizing its mix of natural flats and artificial structures due to development. For this reason there is a wide variety of fishing tactics and opportunities that makes this area unique. One minute you can be casting to shallow Redfish; a few minutes later it’s possible to be dropping weighted rigs to Black Drum around bridge pilings. The upper Bay is a great area for an angler who doesn’t have time to travel far from the city to spend a day on the water. St. Petersburg fishing charters enjoy a generous area off vast shallow flats. This area is well known for large Redfish in shallow water. It is a great area to fish any time of the year. There is plenty of room on the flats and also close to the Sunshine Skyway. If your captain wants to mix it up spending a little time flats fishing and then head to the bridge for some Tarpon, Grouper or Snapper, it is a quick run. 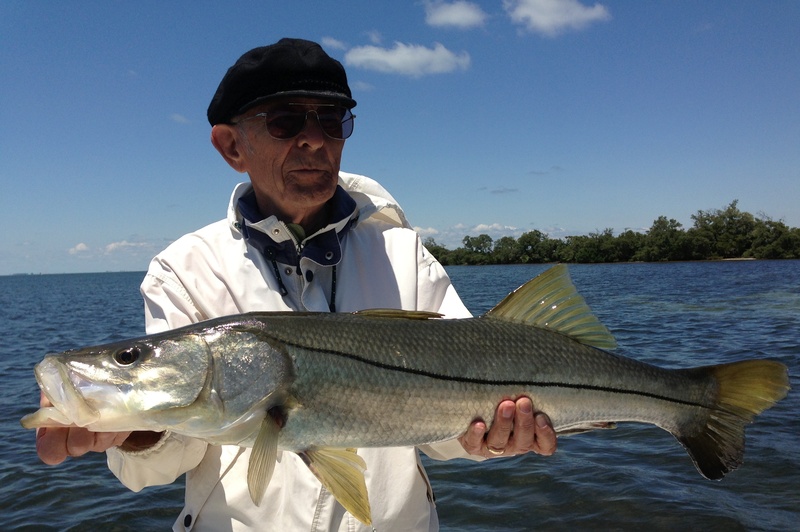 Bradenton fishing charters offer some of the best flats’ fishing in Tampa Bay. The southern shoreline of Tampa Bay offers the largest area of flats with the least development. It is also the home of the Manatee River, the largest river flowing into the bay. The big Manatee River is a nursery to many of the Bay’s saltwater species. 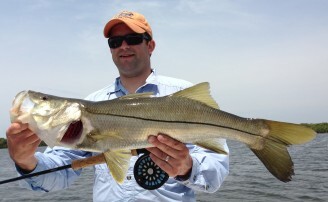 Snook fishing is extremely popular in these parts and by far the best area to fish for them in the Bay. The water is very clear on the grass flats because of the close proximity of the open Gulf making for excellent sight fishing opportunities. For Tampa fishing guides docking from this area Sarasota Bay is a quick easy run to offer even more opportunities. The Sunshine Skyway is a quick run as well for a little Tarpon action before heading to the flats for Redfish and Snook. Inshore fishing tackle in the Bay varies from 10 pound class spinning rods all the way up 150 and 200 pound class tackle for large Sharks. When fishing in Tampa Bay the charter captain must be prepared for anything and everything. Flats fishing boats vary from small flats boats for two man Tampa fishing charters to larger 24 and 26 foot high performance tower boats that can take six fishermen into ultra shallow water and still cross the Bay in a nasty chop. Inshore fishing boats have changed a great deal over the late several years. Some cost well over 100,000 dollars. These boats are custom rigged with observation towers that put the captain’s eyes 13 and 14 feet above the water. The boats have powerful bait wells that move thousands of gallons of raw water into the boat that are able to keep thousands of active minnows alive, a key to great fishing in this area. The most technically advanced boats have very large trolling motors with enough juice to run all day. Powerful trolling motors combined with a tall tower make a deadly combination when stalking and locating large schools of fish. Tampa Bay inshore fishing is unbelievable with an endless supply of opportunities. Tampa Bay charter captains are some of the top professionals in the country in their field offering great fishing 365 days a year.